Last time we learned how the condenser recycles steam from the turbine exhaust by condensing it back into water for its reuse within the power plant steam-water cycle. This water is known as condensate, and after leaving the boiler feed pump at high pressure, it’s known as boiler feed water. Today we’ll introduce a special valve into the system, whose job it is to perform the important function of compensating for lost water. It’s known as the make-up valve. 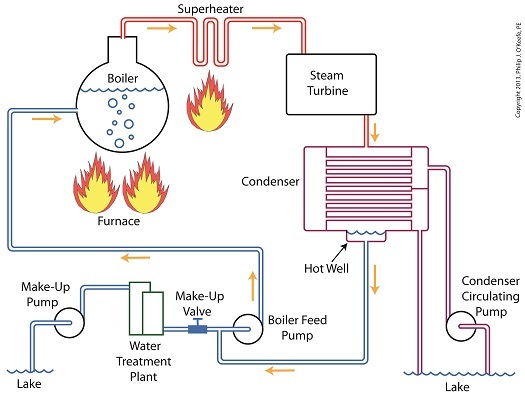 The illustration shows the flow of steam and water within the cycle. Tracing the path of orange arrows will reveal it as a closed system. Under ideal operating conditions recycled condensate from the condenser would provide enough water to keep the boiler indefinitely supplied. In reality water and steam leaks are a chronic problem within power plants, even when well maintained. Leaks typically occur due to worn parts on equipment, a condition which is commonly present due to the demanding operating conditions they must endure. First, there is the strain of continuous operation, then there are the high temperatures, typically greater than 1000°F, and high pressures that pipes, valves, pumps, and the boiler itself must endure. We’re talking about pressure higher than 2000 psi, that is, pounds per square inch. As a result, water levels within the boiler must periodically be replenished. While tracing the arrows through the diagram, you would have come across the new make-up valve under discussion. It’s located on the pipe leading from the power plant’s water treatment system to the boiler feed pump. It’s normally kept closed, except under two circumstances, when the boiler is initially filled at startup, or when water replenishment needs to take place. Due to water loss and difficult operating conditions, maintenance within the water-to-steam system of a power plant is a never ending task. There are miles of pipe connected to hundreds of pieces of equipment, all of which are distributed through a huge power plant structure. So the reality is that power plants operate with a continuous eye on leakage. To contend with the leaks, human intervention is often required in the way of a boiler operator. Their job is to manually open the make-up valve to admit a fresh supply of water from the treatment plant to the boiler via the boiler feed pump. Once the system’s water requirements are replenished, the valve is once again closed. Next time we’ll continue this series by discussing how the condenser enables the steam turbine to run more efficiently by creating a vacuum at the turbine’s exhaust. Last time we learned that our power plant boiler as presently designed doesn’t do a good job of producing ample amounts of superheated steam, the kind of steam that turbines need to spin and power generators. During the process of superheating the more heat energy that’s added to the steam in our boiler, the higher its temperature becomes. However, our boiler can only produce a limited amount of superheated steam as it stands now. So how do we get more heat energy into the superheated steam? Take a look at the illustration below for the solution to the problem. You’ll note a prominent new addition to our illustration. It’s called a superheater. The superheater performs the function of raising the temperature of the steam produced in our boiler to the incredibly high temperatures required to run steam turbines and electrical generators down the line, as explained in my blog on steam turbines. 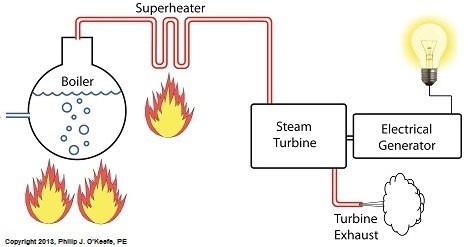 The superheater adds more heat energy to the steam than the boiler can alone. In fact, the amount of heat energy in the superheated steam produced with our new design is proportional to the amount of electrical energy that power plant generators produce. Its addition to our setup will result in more energy supplied to the turbine, which in turn spins the generator. The result is more electricity for consumers to use and a more efficiently operating power plant. But inefficiency isn’t the only problem addressed by the superheater. We’ll see what else it can do next week.